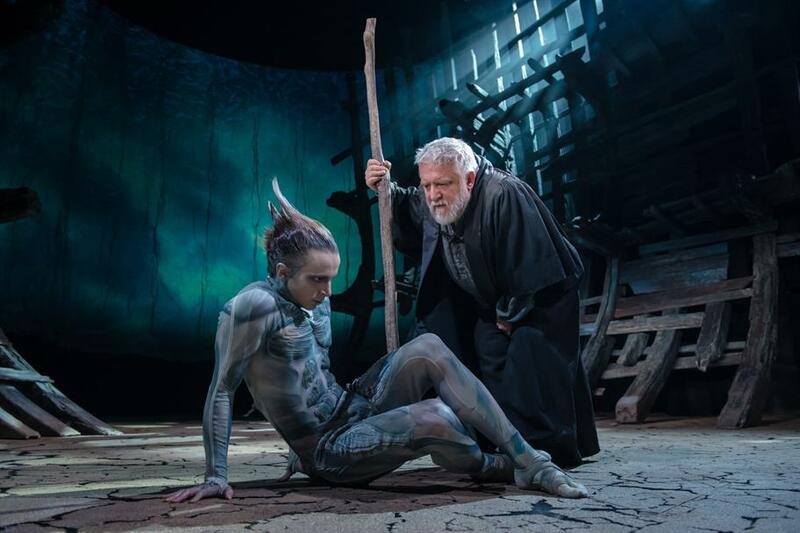 The RSC's production of The Tempest opens with a breathtaking shipwreck scene. The explosion of light and sound immediately grasps you, so that the production has you in its hold from the outset. It is the start of what is a truly spectacular play. The story is set on a desert island inhabited by Prospero and his daughter Miranda as well as Caliban, a grotesque monster and Ariel the spirit. A shipwreck caused by Prospero's Tempest causes several familiar faces to be washed up on the island's shore. We follow them through a series of twists and turns as the story unfolds. The magical aspect of this play is really brought to life through the exciting use of technology. The shipwrecked ribs of the boat sit either side of the stage, framing the cracked floor. The uncovered surfaces light up during the play in different colours- from a fiery red to a tranquil green in the woods, creating different atmospheres in literally seconds. Projection is also used inventively. Drowning men are projected onto a billowing curtain and the twisting pine tree that had Ariel prisoner is projected onto the whole stage, masterfully creating the oppressive feeling of being trapped. It is a truly unique effect. One of the moments in the play where technology is best used is in the masque scene. After Prospero agrees for his daughter Miranda to be married to Ferdinand (who had been washed up on the island as a result of the Tempest) there is a huge celebration with three goddesses, Juno, Iris and Ceres. It is a festival of colour, light and music. Samantha Hay and Jennifer Witton sing absolutely beautifully. The costumes were amazing and the whole occasion was just so magical. In Shakespearean times, this play and especially this section would have been accompanied by the most up to date and exciting new stage machinery. That is exactly what has been used here and yet it never distracts and the play maintains that classical feel. 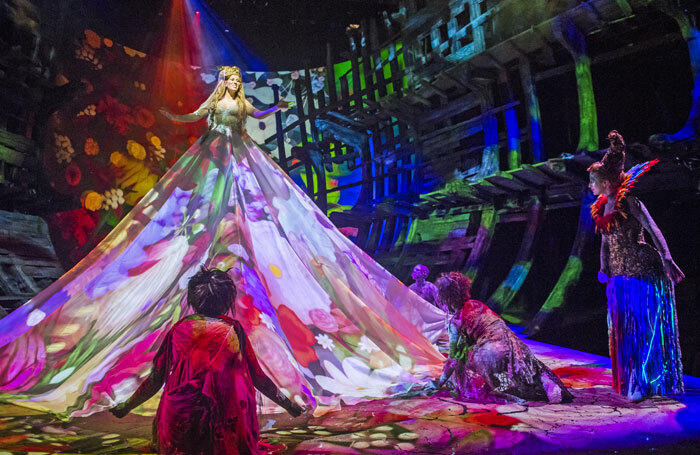 The most innovative and impressive technology used in this play was definitely in the way Ariel was created. Actor Mark Quartley was in a costume that synchronised to a computer creating a real-time projection. So whilst Ariel was moving on stage, an ethereal avatar was floating around mirroring his exact movements - it was mesmerising. Quartley's performance live on stage was wonderful. He moved so nimbly and spritely that it was sometimes hard to believe he wasn't actually a spirit. I thought that his delivery of the Shakespeare was also fantastic. Joe Dixon , who played Caliban, was great too. He managed so well to create an image of the incongruous Caliban. Simon Russell Beale was just superb. His delivery of Shakespeare's prose is fluent and easy to understand - he makes it really accessible. His performance is so convincing and he is so skilful in his ability to hold the audience - to captivate them. No music, no lights, just him and Shakespeare's words. That is the true magic of this play. The Young Barbican scheme has fantastic offers for students. It is free to join and offers seats for £5 for those aged 14-25 (if you purchase them over the phone.) The seats are high up, but for this particular performance, you can see so much more of the special effects from higher up.